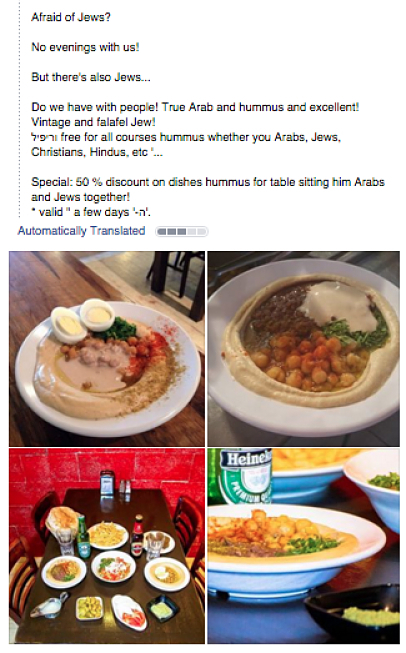 Arabs and Jews who dine together at The Hummus Bar get a big discount for peaceful coexistence. The Arab-Israeli conflict is a thorny issue. It has long been the subject of many a political meeting, and even inspired an Oscar-winning short film. But one Israeli restaurant thinks it may have finally found the solution to bringing about peace and tolerance in the Middle East: hummus. Amidst nearly two straight weeks of terrorist attacks, the Hummus Bar restaurant in the coastal city of Netanya has instated a unique method of trying to foster acceptance: giving a 50 percent discount on every plate of hummus at tables where Jews and Arabs sit together. Just don’t expect Boomer Esiason to show up there any time soon. The move comes on the heels of recent reports that Arabs are facing discrimination in the port city of Jaffa when trying to buy property—an experience that seems common amongst the country’s Arab population. The Hummus Bar’s move definitely seems like a step in the right direction, and is a far cry from when employees were forbidden from even speaking Arabic in some Israeli restaurants. Who knows, maybe half-priced hummus will become the greatest peacekeeping tool of the 21st century.